This stunning collection of 100 HD photographs showcases the exotic, beautiful and spiritual sights of Nepal, home to eight of the world's highest mountains, including the highest of all, Everest. Each photo has been individually optimized to take full advantage of the display resolutions on the iPad, iPhone 3G and iPhone 4 as wallpaper. Photographer Larry Closs, who has traveled throughout Nepal, captured these inspiring images of stupas, shrines, gompas, mani walls, prayer flags and Himalayan peaks on treks through three distinct and scenic regions: The remote Langtang Valley, with its primeval forests, waterfalls, glaciers and traditional Tibetan culture; sacred Gosainkunda, with its holy lakes and rugged snow-caps; and Helambu, with its mystic cloud-covered trails, terraced rice paddies and Sherpa villages. These photos are not available anywhere online for free. 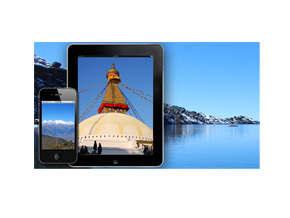 With Nepal In HD your iPhone and iPad screen will even be more stunning!